Copenhagen was rated as the world’s most liveable city in 2013. Cycling is inherent to this quality of life. Denmark’s achievements in cycling are impressive: its cycling mode share is exceeded only by that of the Netherlands. Danish cycle infrastructure is known worldwide for being exemplary; it has influenced urban transport planning around the world, including some of the newest and best cycle facilities in London. This will be an opportunity to experience, first-hand, the quality of life that comes from a bicycle-centric city. We will also experience numerous examples of world-leading urban planning and architecture, the likes of which have rightly put Copenhagen on the design map. Once all the participants arrived on the evening of 30 June, we began our adventures on Friday morning. Our first stop was the world-renowned Gehl Architects where we were given a wonderful overview of cycling and placemaking in Copenhagen by Partner and Creative Director, David Sim. Afterwards, we headed over to the Danish Cyclists’ Federation where CEO Klaus Bondam gave us our first bike tour around the city. 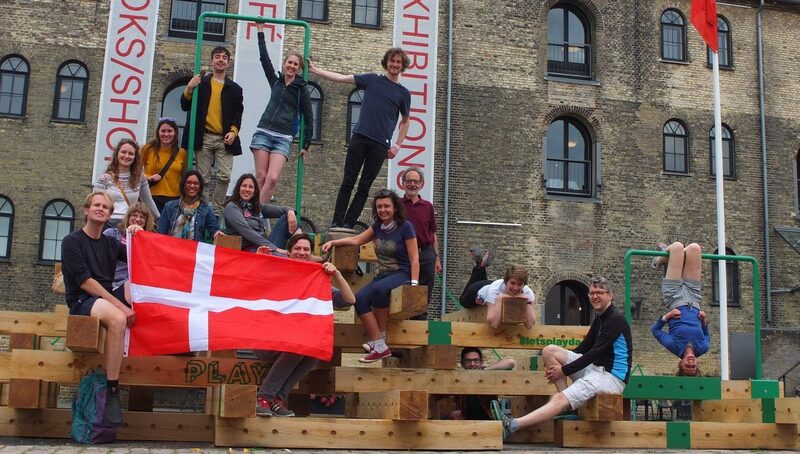 After a quick pitstop for lunch in Torvehallern market, we headed over to the Danish Architecture Centre for their new exhibition on Play in the city. To close out the day, the group took a scenic harbour boat tour to get a new perspective of the city. On Saturday, we ventured out to the suburbs of Ørestad and Amager, led by Joel Mulligan (Partner at København Design & Consulting) before a coffee break at Paper Island. This is where James Thoem, Urban Planner at Copenhagenize, took over and showed us some of the practical applications of good cycle infrastructure throughout the city. After lunch, we cycled to the outer suburbs of Copenhagen along the Danish Supercykelstier to Gladaxe and Lyngby where we had a group dinner before heading back to Copenhagen. The group had a free day on Sunday, where everyone did their own thing, but a large group of us headed out to the Louisiana Art Gallery, which is a must-see if you are in Copenhagen. Monday then saw the group head over to Malmö for the final day, where we were treated to a tour of two unique suburbs, Hyllie and Sorgenfri from Parks Department representative Jesper Nordlund and a presentation from Traffic Planner Daniel Svanfelt. Upon return from the tour, we had an insightful workshop with a number of representatives from the City Planning Office where we discussed potential interventions to improve the two areas we saw earlier in the day. The trip closed out with a quick cycle around Malmö’s Western Harbour and the famous BO 01 district. After dispersing to catch our planes, most went back to the UK, and some participants carried onto further European travel. Overall, a fantastic trip. How do you currently commute to work in London? How do you think your commute could improve based on what you learned on the cycling trip? What was the best bit of cycling in Copenhagen/Denmark or Malmo/Sweden? What did you enjoy the most? What was your least favourite bit? What was stressful/unpleasant? What did you learn from the trip? How did it inform your understanding of cycling, planning urban design and so on? What opportunities do you think there are for implementing Danish style cycling in a place that you know? What specific or general lessons did you take from the trip that you could translate to your work in the UK? Are there any further reflections you have on the trip or any aspects of what you saw/heard/experienced that you would like to share? You can read a write-up of 2014’s trip from Young Urbanist George Weeks here, and an insightful reflection from Ben Hockman on the 2015 trip here. Finally, you can find a wonderful write-up from David Metz about this year’s 2016 Copenhagen trip here. You can also find an album of Photos on the Academy’s Flickr stream here. Right now I am cycling everyday – about 25 mins to 35 mins depending on the route. I think my commute could improve if the culture of cycling was more relaxed and inclusive in London. When I ride on the cycle superhighways I feel I have to ride the Tour de France, my speed, focus and agility has to be right up there. In Demark and Sweden you can ride in a relaxed manner, I would like to be able to do that here. I think a slower, more mainstreamed everyday approach to cycling for Transport culture would help my commute – and all my other trips! Its really not just about commuting right? I live just north of London and it’s a 4-mile round trip from my flat to my work by bike and for much of the journey luckily there is a dedicated cycle route so I’m almost always on two wheels. If not cycling then it’s the local, expensive and unreliable and expensive provincial buses. I currently commute in Birmingham about 90% of the time by bike and the rest by a mixture of walking and buses. It’s about 3 miles form my house to work but takes me 20-25 mins due to a combination of having to take largely circuitous routes to avoid overly busy roads and a lot of traffic lights with long cycles. I love commuting by bike and wouldn’t change it but I sometimes feel that my choice not to own a car and commute largely by active transport is a heavy sacrifice when I factor in the extra stress, danger and exhaust fumes I breathe in every morning..! I always cycle. This is because I know my flat is a reliable 15-20 minutes by bike from my flat. It is by far the quickest way for me to get around, despite the fact that I ride an old Dutch bike in normal clothes. The main thing that Denmark did well was consistency and universality of provision for cycling. Every main road that needs cycle tracks has cycle tracks; you are never stuck without them; the network is well joined-up. This would make my commute easier, as well as other day-to-day journeys in London. When the cycle route network is as well-connected as this, you don’t have to play dot-to-dot along one particular trail; you just go. I live in Dorset and my commute into work is shared between rail transport, my car and my bicycle. For long-distance trips I take the train and when I am working in the Dorset office, my mode of transport depends on the weather. As I learnt in Copenhagen however, there is no such thing as bad weather, just bad clothing! I do prefer cycling into work as it refreshes my mind for the day ahead. I live in Nottingham and commute to Melton Mowbray, a 20 mile journey by car across country. This journey would actually be possible by bike/train if the connection at Leicester was decent. I have a cycle path from my house to the station (a 5 minute ride) and there are ample bike racks at the station in Melton Mowbray (a 1 minute walk from my office), so in theory this journey should work but it doesn’t! It underlines the importance of integrated transport and joining everything up at a strategic level. My commute to and from work in Dorset over the past two years has varied from getting the train, driving, walking and cycling. The method of transport would depend on what would be happening with the weather as well as in the working day and whether there were meetings which I needed to travel to. When the weather was good and I had a free day, cycling and walking were a great way to get exercise before and after the working day. The commute could be hugely improved by adding bicycle lanes which aren’t interrupted by parked cars and suddenly merging into busy pedestrian paths. It was daunting when approaching traffic lights which cyclists would be sharing with cars and I could only approach the lights with care. If Dorset could adopt some of the cycling principles which Copenhagen introduced along their busy commuter routes it would greatly improve the roads for all methods of transport; cars, pedestrians and cyclists. Live in Birmingham, commute by either cycling or public transport. General improvement of cycling infrastructure, particularly segregated lanes on roads and more eligible junctions. I loved the relaxed, laidback attitude and I love the freedom of mobility. I could go anywhere with ease on the bike, not having to think. I felt safe all the time. The segregated cycleways on both sides of the street were great, as soon as we went to Malmo the bidirectional nature of the paths made me feel less safe. It’s really not easy to choose one part it was all so fantastic but I suppose for me it was just being in cities where cycling is the norm. You feel safe, the city is designed for bikes, cars wait for you to pass on all occasions, everyone has their own bike and of course the fact that the cycling infrastructure is integrated with public transport. It’s also the bike mentality; it’s clear it’s in the Danish and Swedish psyche and therefore embedded in decision making at the strategic level. So much of the trip was enjoyable – I think particularly the extent of the city that we covered in a few short days, sometimes repeated but each time through the different eyes of whoever was leading us. A couple of things stood out for me: firstly the feeling of knowing that you’re actually going direct from A to B, rather than wiggling around back streets to avoid main roads. Not having to stress about the multitude of potential obstacles that normally plague my commute; potholes, taxis doing unexpected u-turns, impatient drivers cutting me up, exhaust fumes, narrow lanes with no allowance for bikes, people stepping into the road without looking, having to find somewhere to tether my bike if I’m stopping midway and then worrying all day that it will have been stolen… Also it struck me just how much more bearable the weather was when you knew you were going to be able to move around efficiently and easily. I cycle often in the rain in the UK and I know it will just mean cars driving even more irrationally, more oil and grease on the road, getting soaked and knowing my bike will be soaked when I come back to it because there are few covered bike racks. In Copenhagen, it hardly mattered because the journey was efficient and the storage facilities amazing. I really liked our group. During my career, I have seen umpteen talks, presentations, slideshows and holiday snaps from these two cities. For me, the most exciting thing for me was to go and see them for real and put all the facts and images into context. I now feel that I can talk with a bit more authority on cycling in Scandinavia. Copenhagen’s architecture was surprisingly rich; spires galore, lots of Baroque bridges and a socking great Arts and Crafts city hall. It really is a beautiful city, much more than I had expected. The Malmö railway station cycle parking was very good; I have seen similar complexes in the Netherlands, so it was good to see how it works in Sweden. It was very smoothly integrated into people’s journeys. Malmö Western Harbour was also impressive and I enjoyed learning about the city’s industrial past. Its proud shipbuilding heritage (in a large city far from the capital) reminded me of Glasgow or Newcastle. The combination of tours and talks seemed to be well-received and I would definitely do this again. I enjoyed the smooth surfaces of the cycle paths in Copenhagen and the prominent separation between motor vehicles, cyclists and pedestrians. These factors allowed for easy rides and the flexibility that a bicycle has in being able to travel along main vehicular arteries and then divert through public spaces really does make this the most efficient mode of transport. The cycling was the best bit! There is no better way to understand how cycling design and infrastructure works than to use it oneself. This coupled with very informative lectures/talks by David Sim, Klaus Bondam and James Thoem increased my knowledge and awareness of what is possible, both in terms of retrofitting for cyclists in an existing city and designing from scratch in new urban extensions. The highlight in terms of shear cycling pleasure was the cycle snake down to the harbour, a beautiful bit of design which made everyone exclaim with bliss! How to make one feel special as a cyclist. The whole trip was hugely enjoyable and it was great fun to cycle comfortably and safely within a big group. It was nice to explore hidden parts of all the cities, journeying outside Copenhagen and exploring the suburbs and learning about the architecture and communities. All the cycle trips were fun and incorporated fascinating talks by architects and designers which were made so relevant when cycling around both cities. The last day in Malmo was great fun, I particularly enjoyed BO01 – I have never visited anything like this and it was hugely inspiring. The cycling facilities of both places encouraged the group to discuss what we had visited and learn from one another. Enjoyed the tours of the city we experienced, as well as free time to explore in the evenings. It always felt very safe to cycle and easy to chat with friends whilst riding, making it a enjoyable experience throughout. Cycling out to the suburbs gave me a better idea of how Copenhagen provides infrastructure in less dense areas alongside larger main roads. Nothing really. Perhaps riding with such a large group was a bit stressful, you wouldn’t want it to be any larger. Only the fact that back pedalling braking took a bit of getting used to. Also, we were hit by the heaviest of rainstorms while visiting Freetown Christiania but it actually turned out to be one of the funniest and best parts of the trip – I think my shoes are still drying from it! I can only really pick out one bit that was stressful and that’s a philosophical point raised by David Sim. My choice to travel around by bike and foot is rooted very much in a notion of sustainability and environmentalism – I believe that individuals need to make their own choices and ‘do their bit’ to live sustainably so (even though i’ve heard him say it before) it was actually quite challenging to hear David say that the majority of Dutch people cycle predominately for the ease and speed that it offers them, not some high and mighty new-fangled idea of sustainability and climate change etc. That feels like a double blow to me – disappointing that the choice to cycle is not more principled (and therefore potentially easily reversed if political choices ever dictated a swing back towards car infrastructure) and also potentially another nail in the coffin of UK cycling – the battle to get people cycling at the moment is being fought on environmental and personal fitness grounds, which is only a small proportion of the reason Dutch people cycle. With the best will in the world, I cannot see UK cycle infrastructure (outside London) offering an easier and quicker mode than driving – most ‘new’ cycle schemes appear to be encouraging cyclists away from the busy roads onto quieter yet longer routes, rather than taking the braver and more complex step of tackling the busyness of the roads. Danish junction designs are good, but they are not up to the standard that I have experienced in the Netherlands. The use of “mixing zones” for right-turning motor-and-cycle traffic is not pleasant! Apparently these are being designed out because they do not feel as safe as full (Dutch-style)separation. I was sorry that the trip had to end; I would gladly have explored more of both countries, particularly Lund, which seems to be Durham to Malmö’s Newcastle. Learning to adapt to the popular back-braking system on my hired bike was the trickiest bit! The preparation to stop (with the pedals at a convenient angle to push off from) dictated my last movements as I would approach a red light. This was a new experience however and this style of braking resulted in cyclists being much more aware of their speed on a bicycle, especially when passing pedestrian crossings or turning in front of vehicles. Luton Airport! The experience has made me consider other ways to get to Europe and other options for holidays. My next short break is cycling along the Grand Union Canal and staying on a Dutch barge in Uxbridge; bikes on the train down to St Pancras from Nottingham and then a journey across London to Paddington testing out London’s cycling infrastructure. I will be interested to see how it compares to Copenhagen and Malmo. All elements of the cycling were enjoyable, it was only disappointing when we couldn’t spend more time getting off the bikes and exploring the parks and wonders of Copenhagen and Malmo. The back braking pedalling to stop the rented bicycle was the hardest part of the tour!! It would have been great if the group of been supplied with GoPros to attach to our bikes and take it in turns to take video and photo footage of the trip, documenting and varying the photos. The cycling on a whole was always very calm and felt very safe. Although at one point when trying to get to Christianhalvn it poured with rain and we got soaked! I have been studying cycling and cycling for years and years and indeed working in cycling as senior policy advisor for the DfT on cycling. But for me, the trip was a step-change in thinking and experience. I thought I knew a fair bit, but I was amazed at what I learnt in four days. I think the biggest takeaway for me was that cycling is a part of a much broader effort to ‘get people on to the streets’ or in technical terms, activate the urban realm. The danes commitment to the urban realm is second to none and cycling forms a critical part of that. It is about so much more than cycle lanes, it is about the social life of the city! I was also amazed at what a social thing cycling is in Denmark, everybody is riding about talking to their friends or families, riding together! With their personalised bikes, its a form of personal expression and interpersonal communication – eye popping to me. Something stressed on the trip was the importance of cycling accessibility for all, to show people that cycling is an easier, faster, healthier mode of transport for users. An in practice it feels like it is, from ensuring commuters cycling into Copenhagen city centre get a green light if they cycle at 20kph, giving cyclists a 6 second head-start before cars at traffic lights to bike-only bridges like the Bryggebro (cycle snake). It was good to see the street design principle of [pedestrians – wide bike lane – parked cars – moving cars – parked cars – wide bike lane – pedestrians] in action. Segregated bike lanes are so much more user-friendly than shared-use paths (and much safer I would imagine in terms of pedestrian-bike conflicts). It was amazing seeing time and investment being put into what seemed like ‘little’ interventions, such as the grab rails at the front of traffic lights for cyclists, the advanced traffic signals for bikes and the greenway lights regulating people’s speed. But actually these interventions all had far-reaching safety principles behind them to do with psychology and flow mechanics. It’s difficult to imagine these sorts of things being politically acceptable in the UK when investment in cycling is so tight but I think there are probably lessons to be learnt there about the net benefits of relatively cheap interventions. Interestingly, it was also baffling to hear that a sizeable number of people in Copenhagen won’t cycle because they feel it’s too dangerous! I suppose some people will just never be persuaded out of cars. But at least the UK might have the advantage of starting from such an objectively dangerous point – any interventions will seem much safer to new cyclists! For me, it was very interesting to compare Denmark and Sweden to the Netherlands. The infrastructure of a similar universality; however in terms of junction designs (crossroads, roundabouts, etc) I think the Dutch are better. That said, pretty much cycle junction designs were superior to their UK equivalents. From Klaus Bondam, I learned that the Danes have very strong strategic ambitions for cycling mode share. Copenhagen has enacted consistent policies to deliver this. Interestingly, cycling-related NIMBY-ism is not confined to the Anglosphere; Danes have just the same problem and have had to use a combination of engagement and persuasiveness to deliver on ambitions. Poor but well-run countries (e.g. Denmark in the 1950s) can be at an advantage when the world is having a Modernist craze. This is because they didn’t have the money to do comprehensive redevelopment. This reduces the associated planning disasters and leads to a more resilient urban form. The talks that were provided by local architects and urban designers were really inspiring. They explained the thinking behind the cohesive cycle routes and patterns and I learnt that the most important thing to do is observe, and then design and implement. I also learnt that it is important for cyclists and pedestrians to be kept separate to ensure better travel efficiency and a greater respect for cyclists from both car drivers and pedestrians. I learned that retro-fitting a city for cycling is a gradual process, starting with the easy wide boulevards and then progressing to the narrower streets. I learned about the different grades and design of cycle path to accompany differing speeds of traffic and the importance of separating pedestrians, cyclists and traffic by using split levels in the road where possible. I was interested that in new urban extensions, the needs of pedestrians and cyclists are considered first, and then those of motorists, which is the opposite of what I see in masterplannig for urban extensions in the UK. I learned about simple design details which make a huge difference to quality of experience and safety, but which can so easily be overlooked; for example not putting a cycle lane between roadside parking and the road and using a railing for cyclists to prop themselves against at junctions to discourage jumping red lights. The trip taught me so much about how a city can develop with the focus of good transport connections and encouraging exercise in fun and ingenious ways. All talks and discussions which explained the thinking behind the cohesive routes, widened my understanding and creativity of how much can be implemented to make cycling and walking fun. Cycling doesn’t need to be seen as boring and just exercise, the UK should be looking at all these ideas and introduce conversation cycle lanes and green waves – just some of the great ideas! Broadened by understanding of urban design and the issues it can seek to address. I particularly enjoyed David Sims talk at Gehl Architects which talked about how through urban design and planning of public spaces they can be made to be fun and enjoyable spaces for all, rather than being overly health and safety conscious and plain. Lots! The seamless nature of the cycle journey was a huge lesson. Right now in London the cutting edge cycling infrastructure is very stop start. Its are great point to start from but we have much further to go. Again, mainstreaming it into normal culture and getting people out of lycra and cycling the tour de france. Cycling is about mobility and health and socialability, it’s not about getting fit! I live in a new town in Hertfordshire. It’s arguably one of the most car centric places you can find, low density, separation of cars and pedestrians with underpasses and railings etc. There are some promising signs for since the new station and University have built dozens more sheltered cycle storage places but it’s hard to see any radical changes here. I think the key thing is to continually invest in the local cycle infrastructure in the area, incorporating cycling-friendly design and infrastructure into new developments, local and neighbourhood plans, and ensuring good practice by getting every member of the planning team to visit Copenhagen at least once! The street layout, built form and density of suburban Copenhagen is not all that different to the UK; however they use a combination of filtered permeability and cycle tracks on main roads to allow everyone to cycle. The opportunity exists to do this across the UK; doing so would require political will and long-term finance. It would also require consistent, mandatory design standards for cycling infrastructure. Dedicated off-road cycle paths would make cycling journeys much more pleasurable as currently vehicles do not leave a safe distance when in close proximity. This is due to a lack of change in surface between vehicle and cycle paths which results in parked and moving vehicles obstructing and endangering a cyclist’s journey. Dorset is quite hilly and being beside the coast, there is often a strong breeze so it can take some effort to get into work, unlike the easy, flat cycling in Copenhagen. Providing smooth, uninterrupted cycle paths such as those found in Denmark will allow for safer and less physically demanding cycle journeys and encourage more frequent use of bicycles as a means of easy commuting, rather than just for leisure. In Nottingham, there are places where the design of cycle paths does not work, particularly along the new tram route, which I see as a huge missed opportunity. It is so clearly an afterthought with little understating of good urban design for cycling. Some of this could be improved by collaborating with the people who use the cycle routes and by upskilling the local authority transport planners. Lessons need to be learned for further extensions to the tram network. In Dorset there is the potential for some of the cycling principles – the wide roads could have dedicated bicycle lanes with edge protection and traffic lights for only cyclists. The roads in Dorset are quite hilly and have uneven surfaces, all the roads and paths in Copenhagen were smooth and uninterrupted which made for a more pleasant journey. The Danish style would have to be a phased approach due to the busy nature of cars and buses at the moment. Bournemouth and Poole could definitely be looking at more predestination and ‘hiding’ cars like we saw in a park in the centre of Copenhagen. There is already a great interest in cycling in Dorset but it needs to be encouraged and given priority over the cars which are dominating the roads on the morning and evening commutes. Huge potential but a big lack of political and business support. There are many lessons about design of cycleways and paths, and also general lessons for policy. The cycle embassy work on the bicycle account is a great policy initiative. In terms of implementing Danish-style cycling in the UK, I’m fairly convinced that in most areas, it’s a case of biting the bullet and adapting an entire street rather than implementing elements piecemeal. Adding grab rails or advanced traffic light signals won’t help if after 2 seconds of head start, the cyclist is still being mown down by buses and lorries on narrow carriageways! There’s a particularly busy, wide arterial route into western Birmingham called Hagley Road, which is wide enough to put in a Danish style street and probably still maintain at least 1 lane of traffic in each direction. It’s currently 4, sometimes 6 lanes, a major bus corridor with wide pavements but really unpleasant for pedestrians – I’d be interested to challenge Birmingham City Council to consider a radical Danish street style intervention, even though it currently feels out of the question to lessen the vehicle space because it’s so busy. I wonder what the effects would be if it were to made into a bike corridor with calmed traffic (it’s a 30mph road anyway) and a much better pedestrian feel? It is important to think and plan at a city-region level. This is a point that was well made at the 2016 AoU Congress and is evident in the Oresund region. Emphasise that all cycling and public realm improvements (including trampolines!) are about providing people with reasons to come into the city. It is unlikely that it is a zero-sum game. A city needs many reasons for many people to come in at many times. This is a fundamental characteristic of genuine urbanism. There is much better integration of cycling and public transport in Denmark (and especially in Copenhagen) than in the UK. It is taken as given that bicycles should be transportable on trains and the designs of the carriages reflects this. It is a refreshing counterpoint to Britain, where most train operators regard bicycles as a needless piece of excess baggage and in some cases are making it even harder to being a bike (e.g. mandatory HST reservations on GWR since May 2016). On a more architectural note – as a nation, we should not be afraid to be bold. There were some fantastic examples of renovation, infill development and innovative landmark architecture in Denmark and Sweden. There are many towns, villages and cities throughout the UK that are unable to break through their historical moulds and project into the future. Copenhagen and Malmo presented a good mix of old and new architecture with similarly adaptable streets and good space planning. I learned that there is a long process of negotiation to sell the changes necessary to make cycling properly integrated and that this takes political will as well as planners and designers who have the appropriate skills and knowledge. As a planner I need to take the opportunity to promote and sell cycling at every opportunity. Politicians need to be educated as well as professionals. For example the requirement for taxis to carry a bike rack and for suburban trains to have bike carriages were ideas which were not initially embraced, and took years of negotiation in the latter case. In Copenhagen and Sweden they demonstrated how good design can include old and new architecture whilst implementing adaptable streets and landscape design. It is about making those vital connections between the rural and urban to give access to methods of transport which will only improve our way of life. The Danish were all incredibly welcoming, friendly and most of all – proud of what they have achieved, so far. The UK must look at their ideas and be bold, there is so much opportunity to reflect what the Danish have achieved so well. Lessons from Copenhagen and Malmo such as their efforts to experiment freely with planning rules and try new things without necessarily knowing what the consequences will be. I really enjoyed travelling with a group of like-minded young people and the quality of the presenters and people we met in local government was excellent. The trip was superbly organised and had such a lovely feeling of sociability to it. I loved every moment of it- seriously! It also made me feel young, inspired and hopeful again. I really liked the Danish approach to the design and use of public space, taking every opportunity to bring people out onto the street for food, play, culture, social. There’s no reason why this can’t be encouraged in the UK, we have a similar climate too! The trip was a fantastic opportunity to meet planners, urban designers, lobbyists, architects, residents who are directly or indirectly involved in making their area more cycle friendly. It’s not often you get these kinds of opportunities so I’d like to say a huge thank the trip organisers for squeezing the best out of both Copenhagen and Malmo in the 4 days we were there. It was so well organised and they are both such lovely people. It was thoroughly enjoyable, memorable and inspiring! First of all, I loved the trip as a whole. It was the perfect balance of cycling and learning. I actually really enjoyed that it was not overly cycle intensive, and focussed on seeing a lot of the actual cities involved. When we did have a more cycle intensive day, it was to experience the superhighway and I liked having the opportunity to go further afield and see cycle infrastructure outside of the city centre. I also really liked having a day off sandwiched in there to do other things – yay Louisiana! Personally, the trip had a big impact on me. I had always commuted by tube, because I was nervous of busy roads, getting lost, and massive hills. However, literally my first day back I went and bought a bike and have been commuting by bicycle since. It is so much more pleasant, gets my exercise in, and is way cheaper. It’s a little slow going now as I’m still learning the best routes, but since I use the quiet cycle roads I avoid most traffic, so I can have a nice journey to and from work. I definitely think London can use a few major inspirations from Copenhagen, but my main gripe is parking. The Danish and the Swedes have considering bike parking in everything they build. In London and the UK, we are encouraging biking more and more, and are building cycle paths and highways, but councils and even property developers are still miles behind in terms of providing safe parking and storage for bikes. Until people have somewhere safe to store bikes, I imagine it will remain an unattractive option to people. The best part of cycling in both Copenhagen and Malmo was the fact that I paid very little attention to cars and pedestrians at all. Having everything very separated and aimed at prioritising bikes and pedestrians, I didn’t really have to think about cars at all. In London, I find I am constantly on the lookout for cars and rogue pedestrians, which slows me down considerably. On the subject of pedestrians, that was a major difference too. Culturally, the Danes are used to bikes and paying attention to bikes, so they are very aware of bike traffic. Londoners seem to always be walking out in front of bikes and then looking shocked when they spot you, like they didn’t expect you to be on the road! The trip had a huge personal impact on me and has made me a cyclist, and for that I say thank you! So I have been unable to cycle my bike over the last week, because I had an op on my arm, and it has been so difficult to accept the fact that I must become part of the congestion in London to get to work. My commute to work is a 40 minute round cycle, less than half the time it would take to get to work on any other mode of transport, so the Danes are right, convenience is the key. So under doctors orders I am not allowed to cycle, run or sweat profusely in any untold activities (who do these people of science think they are?) for 3 weeks. While I enjoy the time on the bus doubling up on some reading, I failed science and am cycling everywhere again after a week. But I find it somewhat disappointing cycling around London and introducing friends to cycling in London after my trip to the segregated safety of the Oresund. It’s hard to fathom how we can get London to the level that we saw in CPH, not to mention creating the modal share we would like to see where smart hi-vis cycling tops replace sash seatbelts. Interestingly enough David Metz, uncovered the one thing the CPH seminars and tours failed to say (or rather I didn’t hear) in that the modal share increase in cycling usually comes from those who primarily used public transport as a form to get about rather than cars. Makes sense. As someone who writes policy for cycling and pedestrian walkways now and again, the trip has given me plenty of food for thought on how we as planners/architects/urbanists/cyclists can enable a mindset to make cycling infrastructure key to growing a vibrant economic heavy weight. I think the biggest take home points for me were the issue I raised above about the motivations for cycling but also the example given by Joel of the extra wide ‘conversation’ bike lane. This particularly interested me because it was apparently something the council just trialled to see if it would work and it turns out it hasn’t been particularly effective so they won’t do any more of them but the existing one will stay. I was so impressed with that attitude – rather than launching it as the ‘best thing ever that will definitely work and be amazing’ and then having to make up excuses when it didn’t work, it appeared to me that the council very humbly just suggested it as a trial and then were able to admit it hadn’t worked and move on. I can’t help feeling that in the UK new initiatives are often launched amidst huge political fervour with the need to justify any spending to the umpteenth degree, which doesn’t give councils the room to try things. This perhaps leads to a reluctance to try things that are a bit out of the box or to the unfortunate situation that I see often where something hasn’t worked but rather than bring able to admit it, a council is left pretending it has worked and effectively having to cover it up, which just leads to mistrust. It would be nice to see that culture of trust and therefore experimentation in the UK. Also, Danish authorities have been able to capture value and improvement in economic terms and they now have an arsenal of proven interventions that pass through political hoops very easily. Perhaps local authorities in the UK should adopt the approach of building up similar arsenals where they can prove that interventions have monetary value. Despite the influence of Hans Christian Andersen, Copenhagen and Malmö are not fairytale fantasies. They are busy working cities, with all the opportunities and constraints that this entails. Malmö in particular has had to deal with considerable economic and social problems, yet has done so in a way which appears to be conducive to a very high quality of life. Maybe greater devolution in the UK would better allow city regions to take control of their destinies in a similar fashion? I was interested to learn that people in Copenhagen cycle for convenience, not for fitness or out of a desire to be environmentally-friendly. In fact cycling is more closely aligned to the private car in terms of its individualism than public transport, which I had never considered before; cycling and public transport are always coupled together as ‘sustainable’ choices in the UK and seen as conceptually different to car use. The biggest shock of the trip was to discover that the Malmo planning office has a strategic planning team of 50. This is compared to a team of 10 at Nottingham City (which is the same size as Malmo – @ 300,000 population). This has implications for the quality of what is delivered. The issues and challenges of creating new sustainable communities are largely the same for Sweden and the UK, which I found interesting, but the delivery is in a different context. I couldn’t help but feel depressed, but it won’t stop me trying! The trip was extremely well organised and I enjoyed every aspect! The food could have made the trip cheaper, perhaps looking at making sandwiches for the trips but overall it was fun to explore the local restaurants. All round a really good trip and great to meet a new bunch of people and experience a new place with them. I came to this wonderful city as part of a group of young urbanists wanting to explore the city on bikes to see how its planned and how it works. Little had I thought what a transforming trip this would be! That I would fly over this wonderful city back as a different person – so little I knew of Planning! Or should I say, so little I remembered of planning from what I studied! Working as a policy planner it’s easy to get absorbed in strategic planning and forget about the other aspects of planning. The role that design plays in planning, in creating places that work. Integrating design to make places work is the key to good planning! The role of urban designers and architects in creating places is important and should be made fundamental in urban planning. A concept that I realised and felt after attending the wonderful presentation by David Sim at Gehl Architects. David Sim talked about the sensory responses towards a place, James at Copenhagenize talked about understanding of behavioural patterns in order to make a place working. Concepts like these – either I’ve been too busy to pay attention to them in my profession and life both, or they really don’t exist in most places that we visit, use and live – perhaps. I think the latter stands correct. They need to be integrated closely rather than being divorced from planning. This city works for its people. And people are happy and proud. At this point, I would however like to cite a recent experience that I had in Britain, where I live. A similar feeling that I experienced whilst driving past a village in Britain in Leicestershire, ‘heart of rural England’! I had gone to see the country fair in a public park and ancient woodland which is a designated site (SSSI) with my husband and my daughter. On our way back we drove past this beautiful village and I suddenly had this noticeable ‘happy feeling’ whilst driving past it – the village had a special character with beautifully decorated houses, streets, shops and a beautiful square that looked like the pride of the village with a lovely small decorative green patch in the middle, a public house and some other shops around. This made me think on my return that this is the type of place that we “intend” to build through planning. A place that makes those living and visiting feel really happy (read elated). What is the key to this!? No houses? Less houses? Less development? Is that possible!? What can be done.!? Or houses that strictly incorporate design standards both inside and outside, houses that carry a Building for Life mark, a master plan that connects places / areas with existing infrastructure / elements and contributes positively into the area! e.g. Copenhagen – through the tour we got to see and learn about some of the good examples of creating public spaces. The large public space above the underground car park was an excellent example of how spaces can be created that people of all ages can use! The large area that is used by children and adults alike for physical activity is also used for the little informal market in a dedicated space! Not to mention that the area is very well connected with the rest of the city through a designed cycle route network, which was a delight to travel to! We were lucky to get to see some of the other examples of well-used public spaces including the trampolines on a public street! We got to experience this for ourselves when we jumped on those trampolines what a little bit of physical exercise does to elevate the moods of people! Coming back to planning as that’s what I naturally do, wonder if these could be a part of community services, facilities or wider infrastructure that could be provided through developer contributions also – this may depart from the topic, so I shall not go into detail here. Although one thing that I will mention here that in one of the talks we learnt that the City has funding for these facilities in Copenhagen. Attitude – yes, when we can safely say that there is a lack of support from overwhelming number of communities, and that a little bit of shift in the attitude towards development will help, it will be important to acknowledge that inclusion of good design in development WILL help that process. But, is that profitable? Is that lucrative for developers to do? Or would they rather just build blocks, buildings resulting into places clearly lacking thought and character, and instead of contributing positively into a place / area new build would steal away the beauty of an existing settlement / area / place / city! How do we create conducive (market) conditions and incentivise the developers to build beautifully? Lady at Malmö city planning office mentioned that they “create conditions and incentives” for developers…. Should granting permissions become more stringent? Should there be stricter design codes in the local areas to grant permissions to schemes of over a certain size…? Or should there just be plain 5 year land supply!? Continuous! Doesn’t this come back to be able to build more (to good standards) and continue to find and encourage supply as people will be more encouraged to build, have less objections etc etc etc and etc due to good design standards. Vicious! Or should this just be scrapped by the government – lack of 5 year land supply which gives way to development under the golden thread of ‘sustainable development’ under the NPPF! Now shouldn’t there be a review of NPPF of this particular aspect!? And hence then should only grant permissions that are truly sustainable holistically and create a positive impact on an area or a settlement! Or is it about time that we expand the definition of ‘sustainable development’?